A Queen Triggerfish poses for our photograph at Bloody Bay Chimneys Reef north of Little Cayman island. 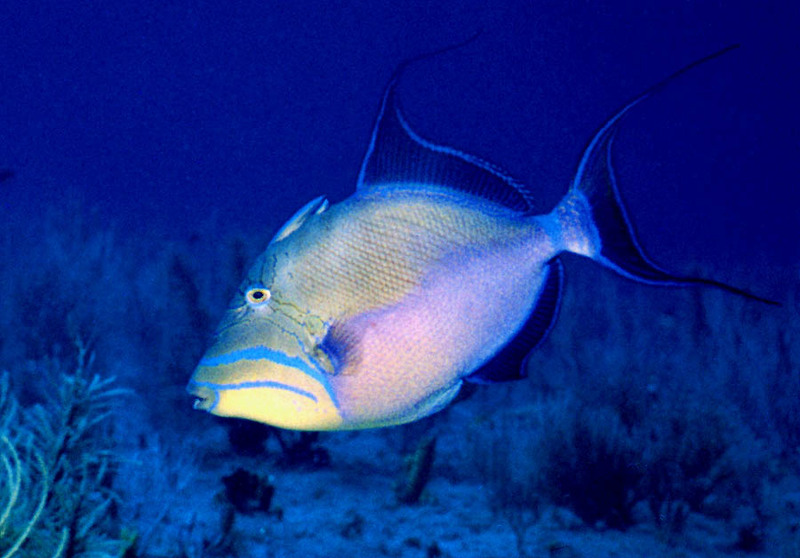 Queen Triggerfish are beautiful, and are often seen swimming above the reef foraging for food. Some scientists think the Queen Triggerfish's flamboyant eye markings help to camouflage its eyes, concealing the fact that it is a predator. Tessa Dowell is the ReefNews photographer who took this picture. This was one of the first underwater photographs ever taken by the ReefNews staff. This Queen Triggerfish was 20 inches long. Copyright © 1997, 2002, ReefNews ®, Inc.